A spacious 2/3 bed family home with front garden & rear yard with secure brick shed. Close to playing fields & play park. Comprising of: fitted kitchen with new oven & hob, extractor fan, gas Combi boiler, fittings for washing machine/dishwasher/tumble dryer, linoleum flooring. Lounge, bathroom, study. Carpeted throughout, curtains & lighting provided. Currently being re-decorated and carpeted throughout. Would suit a couple, family or two individual professional share. £615 PCM, deposit £615. References required. NO SMOKERS, NO PETS. A superbly presented apartment in a sought after residential area not far from the town centre and The Pavilion Gardens. Offering two bedroom living accommodation and benefitting from gas central heating, allocated parking and a garden. Halogen hob, oven, extractor, dishwasher and integrated fridge/freezer. Cupboard with plumbing for a washing machine. £750 PCM DEPOSIT £850. NO PETS, NO SMOKERS, NO HB,NO DSS, NO CHILDREN UNDER 10 YEARS OF AGE. A detached property situated in a quiet, convenient location on this popular development. With open plan lounge/diner, kitchen with appliances, wc, master bedroom with en suite bathroom, two further bedrooms and a bathroom. With gas central heating, sealed unit double glazing and with the benefit of a single garage and gardens to the front and rear. NO PETS, NO SMOKERS, NO STUDENTS. £825 PCM DEPOSIT £925. A substantial stone built office accommodation on two floors with formal boardroom and bathroom and kitchen facilities. With security privacy sealed unit double glazed windows, alarm and fitted throughout to the very highest of standards. With full Internet and telephone access suitable for five or six person business occupation. With parking nearby. £12,000 per annum, flexible lease terms available. A recently re-furbished ground floor unit currently with A1 usage in the heart of Buxton's historic town centre. Suitable for a variety of uses subject to any relevant planning permissions. Within easy reach of the towns shopping centre and central to the lively Bar / Restaurant area of lower Buxton and opposite the Historic Buxton Crescent soon to be a 5 star Spa Hotel. Main retail area 23'11 x 15' 11 narrowing to 12' 11 with separate Cloakroom with WC and wash basin. Rear storeroom 21'2 x 10'5 narrowing to 5'4 with storage cupboard and boiler cupboard. Gas fired central heating throughout. Rent £19,950 per annum. Flexible lease terms available. A prominently situated 240sqm double fronted commercial premises with first floor apartment above. 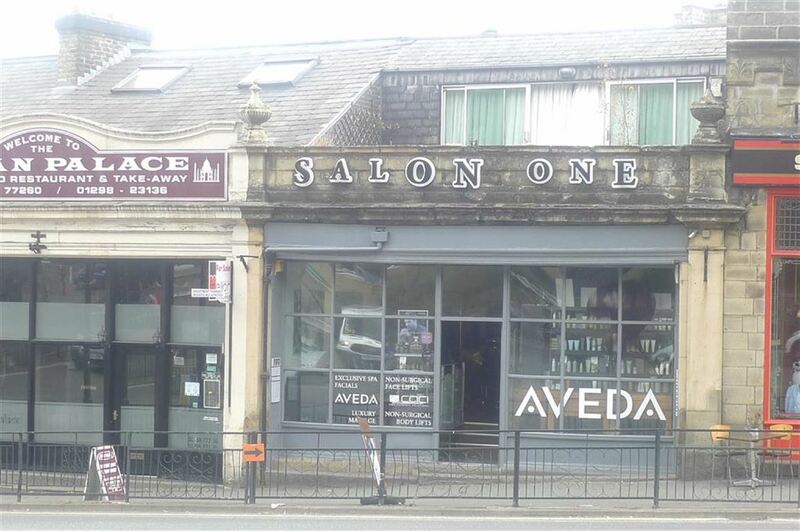 The ground floor and lower ground floor have most recently been used as a hairdressing salon and beauticians but are now vacant and suitable for a variety of other uses subject to any necessary consent/change of use. The one bedroom apartment is let out on an assured shorthold tenancy.